THREE SISTERS by Anton Chekhov, translated by Karen Vickery, in the Reginald Theatre, Seymour Centre, Chippendale. 28 July-13 August. You may have detected a slight fall off of my Diary reports on theatre experiences of late. My explanation is that I have been engaged in rehearsals for the Sport For Jove production of Anton Chekhov's THREE SISTERS. It is now playing in the Reginald Theatre at the Seymour Centre. It is a piece of serendipitous timing as this 'reflection' happens to be my 1000th entry to my Theatre Diary blog! As someone in Muriel's Wedding says: "What a coincidence!" Sport For Jove asked whether I would like to direct a production for them, way back in 2013. I met up with Damian Ryan, the Artistic Director, sometime in 2104, and presented him with a list of some 47 plays I would like to direct. He chose from the list Anton Chekhov's THREE SISTERS. I asked if he were sure. He was. He felt it had been some time since Sydney had seen the play. I was pleased because it is my favourite play from the last century - it first appeared in 1901, at the Moscow Arts Theatre. I have some 23 different translations of the play, including the Aubrey Mellor and Robert Dessaix 1988 version for Belvoir St. I invited Karen Vickery, a colleague, actor, teacher, writer, friend, a fluent Russian speaker, reader and writer to prepare a new translation. We had worked together before. I believe it is necessary that Australian audiences have a contemporary translation of the other language plays, if possible. I was conceiving a production set in Russia (Perm -'a provincial backwater') in 1901. The work was to accurately present this recognised masterpiece of the theatre without expurgations or dislocations. We hope by being faithful to the original to reveal the power, the reason for this play's greatness, without compromise or fop to some contemporary 'commercial' demands - '90 minutes/no interval; a cast of no more than 10!' There were to be no adaptations - just as accurate a translation for our contemporary Australian ears as possible. I wanted the actors to feel that we were creating a brand new Australian play. My principle instruction was that the syntax of the score of the text was as deliberate as Karen intended. The play usually plays at 190 minutes with one 20 minute interval. Ours clocks in at 200 minutes with one 20 minute interval. I auditioned some 167 actors in March, 2016. I was looking for actors that could act, and actors who were, what I called, "Mad Actors" - actors of explorative courage. I had an embarrassment of riches to choose from - I thank all who came to see me. I could have cast the play many times over. All with a unique chemical possibility of exciting exploration. I chose carefully and now you can see the result. Our unique result. Sport For Jove gave me free rein as to whom I could work with. How lucky I have been. Sport For Jove are a marvel - Steven Tait, an absolutely amazing Production 'boss'. I set up a series of lectures under the banner of THE ANTON PROJECT, for the general public. Speakers were Anthony Skuse (on Anton Chekhov), Maria Lobytsnya (on the history of Late 19th Century Russia), Ken Healey (on the music of the Russian society of the time), Karen Vickery (on Translation) and a Russian folkloric dance class by Wanda Wojtulewicz-Levine, which were held in March, April and May, 2016 in the Sport For Jove studios. Influenced (all my life) by a long essay by Dr Jonathan Miller, SUBSEQUENT PERFORMANCES (1986), I wanted all the artists involved to approach the play as if it were an entirely new play. A new Australian play. We would immerse ourselves in the history of the play, the biography of the writer, the social, political and cultural history of the society that first cast this play into the world's consciousness, onto the stages of the world, and through our peculiar combined Australian 'lens' and interpretation of those elements, to create from our unique, personalised and 'learned' response, to explore and discover our team's story for this great play. We have wrestled in detail, in our limited time, with this great work to find our way to have the play to speak to you in 2016. To attempt THREE SISTERS is, I believe, a theatrical equivalent to climbing Mount Everest. THREE SISTERS, the highest 'peak' on the theatre landscape of endeavour - at least, for me. 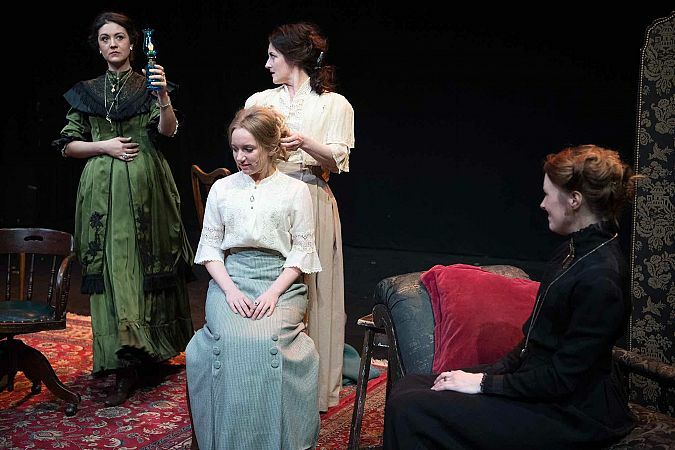 THREE SISTERS was Anton Chekhov's first play written, in 1901, especially for the Moscow Arts Theatre, run by Konstantin Stanislavsky and Vladimir Nemirovitch-Danchenko. They had, previously, presented THE SEAGULL (1898) and UNCLE VANYA (1899). Chekhov was, and is, famous for his Short Story writing - a must to have read to appreciate what he was attempting in writing his plays. Chekhov was a doctor and had self-diagnosed his tuberculosis when he was in his late twenties. He, generally, ignored the prognosis. The disease had progressed quite savagely and he was hemorrhaging blood regularly whilst at the task of writing THREE SISTERS in Yalta. He also, incidentally, married Olga Knipper, a leading actor of the Moscow Arts Company, for whom he wrote the role of Masha, at the same time. He died in 1904, after completing his great comedy, THE CHERRY ORCHARD. As I am particularly indebted to the writings of Orlando Figes, and his two great books: NATASHA'S DANCE and A PEOPLE'S TRAGEDY, to gain an insight into the world of Russia., I recommend them to you. Too, the writings of Schopenhauer and Nietzsche have informed the work we have undertaken. The rehearsal process was a joy. Karen Vickery's translation was embraced enthusiastically by us all. It has a muscularity, a directness and a comfortable 'feel' in the mouths and ears of this young Australian company. Karen being a fluent Russian speaker, writer and reader had the advantage of also being an actor - this, I suspect, has been a unique asset for this work. I, personally, feel it is a remarkable translation - and, of course, I would say that, wouldn't I?. (Sport For Jove are publishing this text and it will be soon available). Janine Watson (Olga), Paige Gardiner (Masha), Zoe Jensen (Irina),Tom Campbell (Andrey), Lauren Richardson (Natasha), Lyn Pierse (Anfisa), Kenneth Moraleda (Kuligin), Noel Hodda (Chebutikhin), Justin Stewart-Cotta (Vershinin), Graeme McCrae (Tuzenbach), Dorje Swallow (Solyony), Michael McStay (Fedotik), Shane Russon (Rode), John Grinston (Ferapont). Some 14 speaking roles which were augmented with some six dedicated and remarkable young artists to play various servants, soldiers, musicians, beggars, written by Chekhov but not often present in professional productions: Matilda Brodie, Richard Cotta, Alexandra Kelly, Anthony Sadler, Mariya Tkachenko,Tamila Tkachenko. All of these artists worked openly and tirelessly to solve our production. Georgia Hopkins designed and created the Set Design for the four acts of the play (assisted by Angelika Nieweglowski), whilst Emma Vine Designed, found and created the enormous Costume demands (assisted by Hanna Smith). We wanted a realistic look, furniture that did not necessarily match and 'clothing' not costumes. Martin Kinnane Designed the Lighting and Peter Neville Composed the score and Designed the Sound. All of this was remarkably Stage Managed and organised by Aeva O'Dea (assisted by Alexandra Kelly). My assistant was Suzanne Pereira - invaluable and discreet. The word of mouth response has been encouraging. The critical response, generally, enthusiastic. I recommend that you browse Dianna Simmonds and her STAGE NOISE response. Also, that of Jason Blake and his EIGHT NIGHTS A WEEK. I have had a wonderful time. I loved being in a rehearsal room again. I loved working with all these generous artists. I want to do something again, soon.